It's been barely a month since Android 4.4.3 started rolling out for Nexus devices and Google has already started rolling out the 4.4.4 update. But while this may not be as big an update as its predecessor (which itself wasn't especially big) it does take care of a major security issue. According to the change log posted by Sprint, this update just brings a security fix. According to Android Police, it contains a patch for an OpenSSL bug, which would have allowed a man-in-the-middle attack. This is similar to the Heartbleed bug that was addressed in 4.4.3 update. The OTA update is just rolling out for the Nexus 5 for now but Google has provided factory images on its website for the Nexus 4, 5, 7 and 10. If you used Towelroot to root your device then it will remain unaffected. 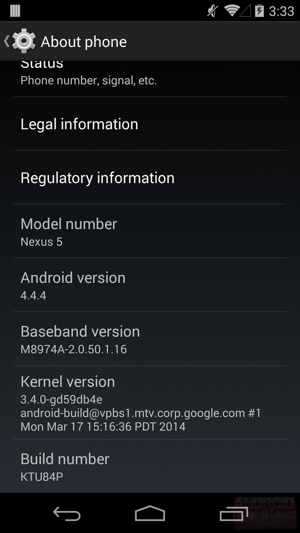 hey , guys i hve a nexus 5 and now i have the kitkat 4.4.3 should i upgrade to 4.4.4 yes or no and why ?